Is The EPA Superagency Bigger Than The President And Congress? 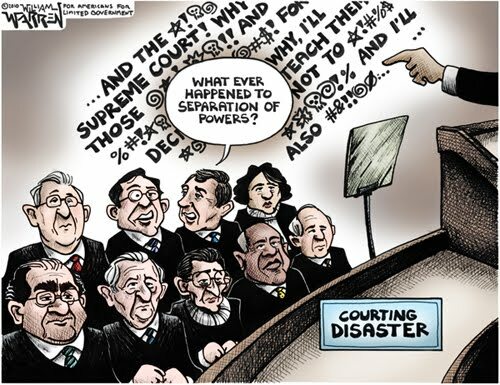 So much for the separation of powers. Thanks to federal court rulings, even if Mitt Romney prevails in Nov., he will be hard-pressed to unilaterally rein in regulatory overreach by the Environmental Protection Agency (EPA). The problems at the agency are fixable, but they will require decisive action by Congress and the president — and even then courts may remain a likely avenue for radical environmentalists to enact sweeping restrictions on the energy industry, the wider economy, and everyone’s standards of living. Under the Obama Administration, the agency has taken the habit of entering into “sue-and-settle” arrangements with radical fringe groups. This is where an organization sues the EPA demanding that they enforce the law in a new, expanded way. The EPA then enters into a consent decree with the party, which is signed by a judge without review, since the two disputing parties are in “agreement.” Suddenly, the EPA’s power under, say, the Clean Air Act or the Clean Water Act has been expanded dramatically. Does that sound like the normal process for a bill becoming law? This process completely takes Congress and the Presidency out of the equation. It is that easy. And it is becoming more widespread. Besides the EPA, radical groups have also used the tactic on the Departments of the Interior, Transportation, Agriculture, and Defense, the Fish & Wildlife Service, and the U.S. Army Corps of Engineers. Lankford called attention to two notable rules changes that have resulted from sue-and-settle. The first was the implementation of regional haze regulations by the EPA even though the Clean Air Act gave that power to the states, which is being used to threaten the closure of the Navajo Generating Station that provides supplies electricity for the 14 pumping stations required to move water to southern Arizona for some 80 percent of the state’s population. Another example Lankford cited was the implementation of regulations affecting new coal-fired power plants being applied to existing ones — so-called New Source Performance Standards (NSPS) for Electric Utilities. Both efforts are designed to force existing coal power plants to be retrofitted with costly technologies that will make delivering coal electricity — currently at $30 to $35 per megawatt hour to produce — much more expensive than it is today. By 2017, the Department of Energy estimates that the Obama Administration’s policies will have tripled the cost of coal to anywhere from $97 to $139 per megawatt hour. That is one of the reasons why Americans for Limited Government has filed a Freedom of Information Act (FOIA) request in May to get to the bottom of what could be another sue-and-settle regulation in the making related to coal-ash. We have requested — and are still awaiting — all communications between the EPA’s Offices and the eleven groups which sued the Agency on April 5 including the Sierra Club, Chesapeake Climate Change Network and Physicians for Social Responsibility. More broadly, thirteen state attorneys general including Oklahoma Attorney General Scott Pruitt have similarly filed a FOIA request to obtain communications on all of the previous sue-and-settle regulations, alleging that some of these consent orders may be prearranged. Pruitt noted to the Edmond Sun that the EPA has in some instances entered into a consent decree the same day the lawsuit was filed. But even if Romney managed to rein in the EPA and other agencies’ sue-and-settle tactic by fighting the cases in court, that is no guarantee of victory. Massachusetts v. EPA was one such case where the Commonwealth of Massachusetts sued the Bush Administration to regulate carbon dioxide, a biological gas necessary for the very existence of life, as a “harmful pollutant” under the terms of the Clean Air Act. itself argued against such an interpretation, the Supreme Court arbitrarily changed what the law meant, leading to the EPA’s carbon endangerment finding and subsequent rulemakings in the Obama Administration’s war on coal. Merely fighting in court — and leaving the nation’s energy independence up to judicial whims — is no longer a strategy the American people can count on. That is why Romney should focus on legislation that will explicitly make clear that neither the Clean Air Act nor any other federal statute can regulate carbon dioxide as a pollutant. Further, Congress must work to repeal or reform any statute that the EPA’s expansive, judicial-created powers have been based on. In addition, as president, Romney would need to go at agencies administratively and clean house at the EPA, the Departments of the Interior and Energy, the Fish & Wildlife Service, and the U.S. Army Corps of Engineers that are seeking to control all land use across the nation. The envirocrats are relentless and must be fought at every turn. They have used the courts to unilaterally expand their own powers, all in defiance of the separation of powers to create a superagency. This issue is not only about reclaiming American energy independence, it is about restoring the rule of law to Washington, D.C. and the consent of the governed more broadly. Reining in the EPA and other agencies is going to be very difficult. However, no agency of government should be bigger than the President of the United States and the members of Congress who are elected by the people.